With the Cathedral project squared away, its time to focus on the Space Wolves for a bit. 'Blog Wars II' is set for the 5th of December so i wanna get this army ready for then, just in case i decide to take it over my Guard! 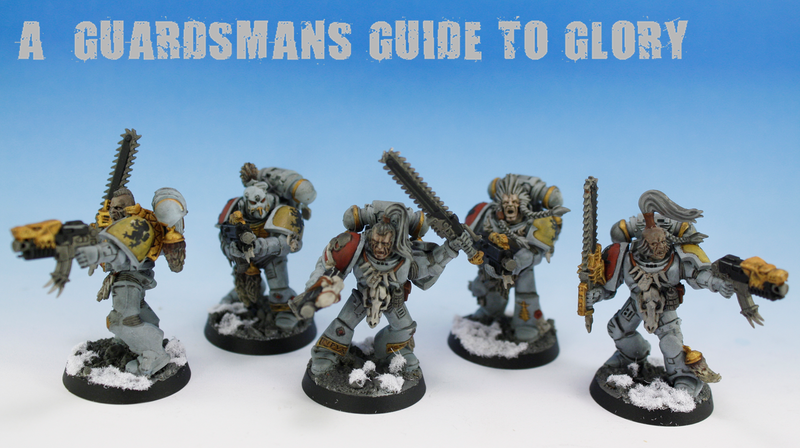 So what we have here today is another 5 Grey Hunters. Dunno whats happened to the gold in this picture - its gone all yellow! Gonna have to get this photo thang sorted out! Anyhoo, I'm really happy with how this colour schemes going. I was a bit unsure at the start but I'm really diggin' the classic Wolves look! Its nice and easy as well; the next 5 Wolves are nearly done already! 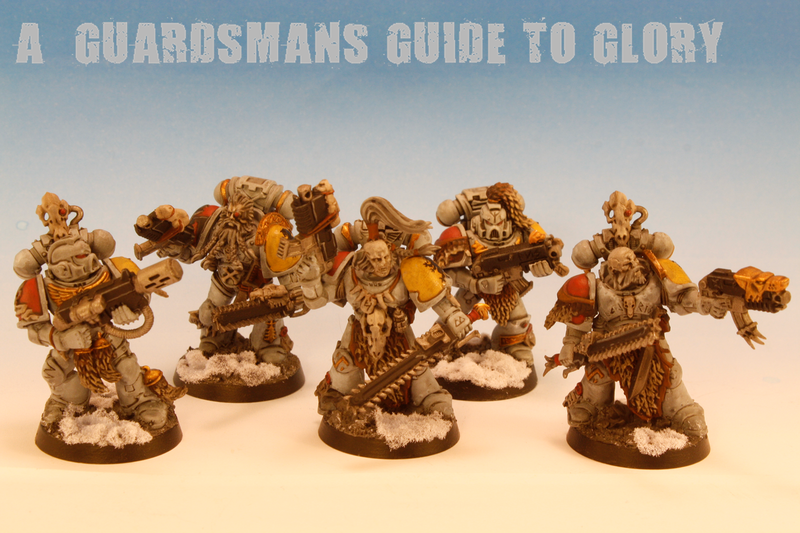 5 more after that and the Grey Hunters will be complete! 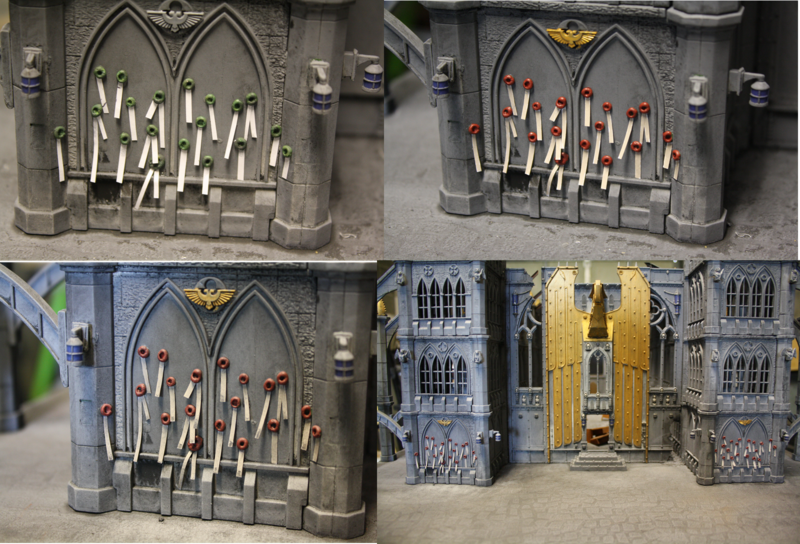 Also, I've tweaked the rules for the Cathedral a bit following some excellent feedback from a few readers! The rules set has a little bit more meat on it now! Last night i knocked out a quick data sheet for the Apocalypse Scale Cathedral I completed yesterday. Take a look and see what you guys think! 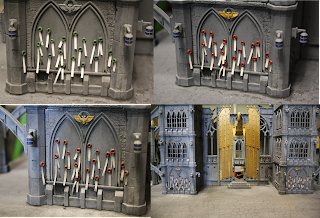 Its been a bit of a slog over the last month and a half, but now i am pleased to report that the Gothic Cathedral Project is now complete! Instead of blogging every little update over the last 2 weeks, i just decided to press on and get the thing completed. Here are a few of the last bits that were done to complete the project. The Pews. 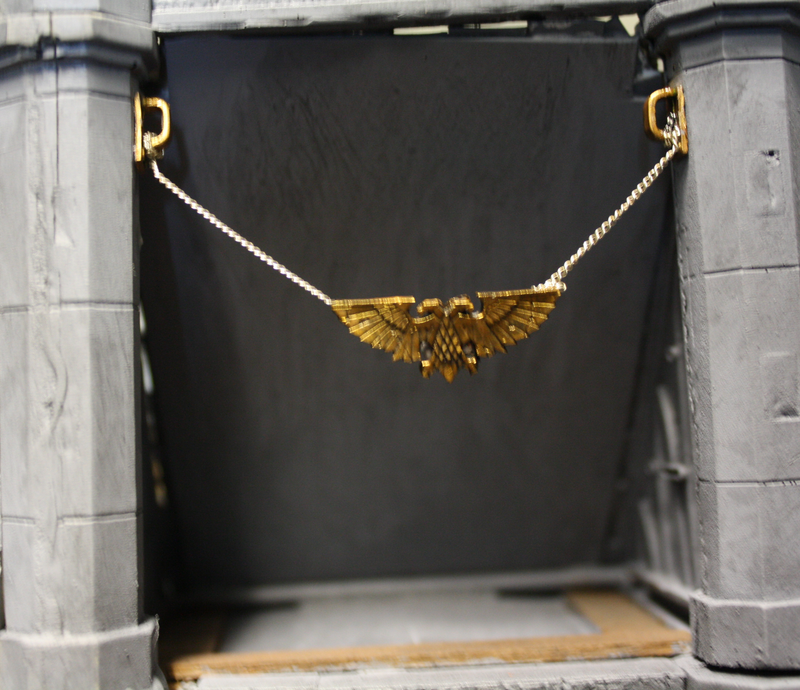 They're in place and washed with oil paint which has given them a really good time-weathered look. I decided to make a barricade out of the pews near the entrance of the Cathedral. A hurried defence for some beleaguered defenders! The Alter. This was made out of left over Balsa Wood. I made the simple shape, then got a shred of old t-shirt and cut it to shape. this was then soaked in PVA glue, draped over the alter, and left to dry overnight. A quick spray of Macherite Red and a few embellishments and its done! Quick and simple. Purity Seals. Where the prayers of the faithful are left in hope of an answer. Simply made from green stuff and strips of paper, then washed with oil paint. A nice touch i thought! Relic. I needed to find something to fill the space at the back of the Cathedral, so a hanging Aquila Relic worked nicely. Excuse the picture - i had to shove the camera inside and try and take a picture blind! This was the best i could do! Its a bit small, but i didn''t want to make a home-made large Aquila and risk it looking a bit shoddy. Finally, the roof! The solid roof idea was abandoned some time ago, mainly due to the irregular shape of the walls. I figured a ruined roof would save time and hastle, and enhance the playability of the piece as a whole. I've gone for 2 large ruined sections and 2 small ruined sections. 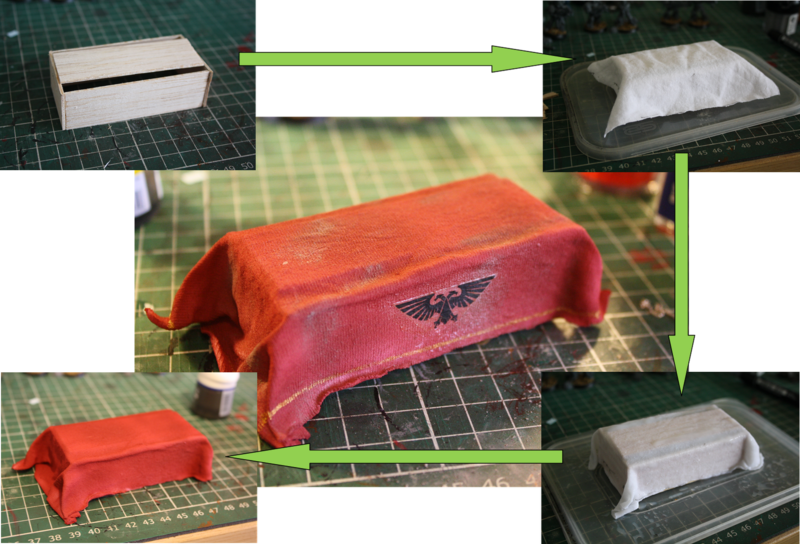 I installed a plasticard base onto some plastic T-Bar and then glued plasticard tiles too it. A quick coat of Charadon Granite and an oil paint wash and its done! The T-Bar was undercoated in Scorched Brown and then attacked with some rust coloured weathering power. Where there isn't any ruined roof sections, theres a rusty T-Bar instead! So with all those bits in place, its DONE! As much as I've enjoyed this project, I'm glad its complete. Some things can really rumble on! So what now? Well, the Space Wolves project is still in its infancy and needs a bit of attention. That will be my main priority for now. 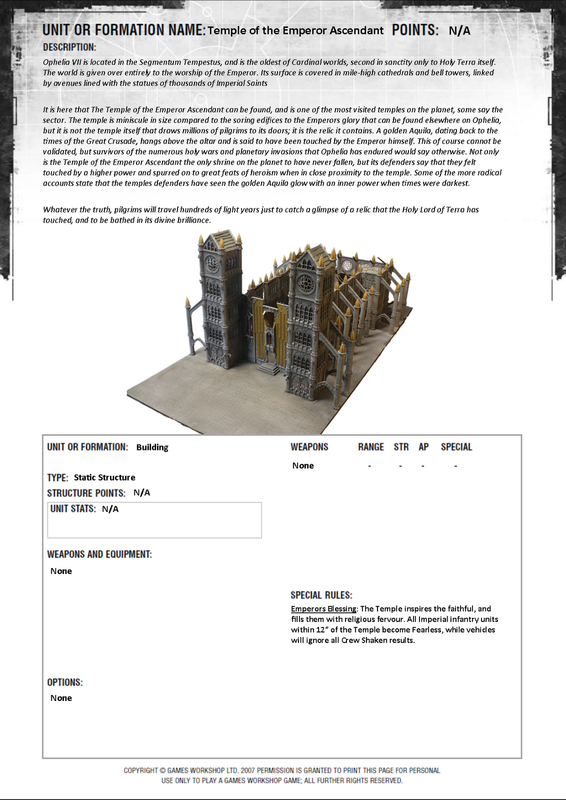 Saying that, I'll probably begin planning my next Apocalypse Terrain project: A Promethium Refinery! This project will be even larger than this one, covering a 12x6ft area!! More on that as it develops over the next few months! 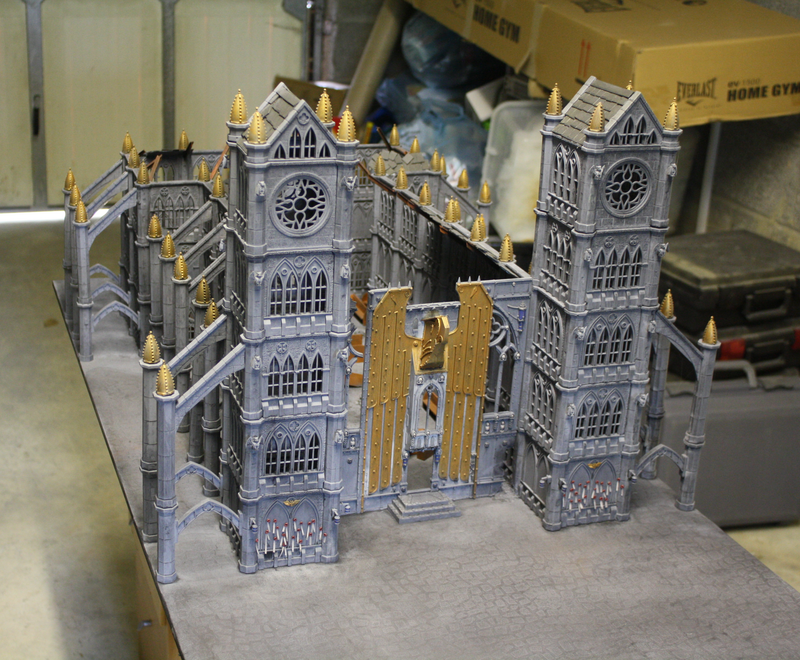 Theres been some real progress on the Cathedral in the last week or so, and I'm not to far off completion! And I've washed the whole thing with an oil-paint-wash! This stage really helped re-define the 'crazy paving' on the base as well. I decided not to dry brush the whole thing and instead relied on a heavy wash to pick out the detail. Besides, if the wash doesn't quite cut it, then i can always add a dry brush layer. At the moment i think the wash will do, but i guess we'll see once its dried properly. I've been thinking about the interior a lot as well. I'm going to scrap the balconies, and theres two reasons for this. Firstly, playability. Secondly, space. There wont be any room for the intended spiral staircases, and in think ladders would look a bit shoddy! I think that the lack of balconies will make the interior space much easier to play on as well. Again, these can always be added later if theres a dire need for them after play testing. So between bouts of thinking, i cracked on with the pews. These were easy enough to make. I made them out of Balsa Wood rather than plasticard. This will save me having to make the pews look 'woody'! I made as many as i could out of the strip of wood i bought, and got 18 out of it. I don't want the whole Cathedral filled with pews, but a scattering of them! Some will also be made into barricades and some will be smashed up! Presumably during the course of the war, they were scavenged, stolen or vaporised! I used an airbrush to spray them with Bestial Brown. These will be shaded later with an oil-paint-wash, probably after they're glued in place. So that's where I'm at now! Theres an Alter to build, some ruins and rubble to add to the interior, and a few statues to buy and paint for the 'front porch'! Then the final (and maybe the most difficult bit) - the ruined roof! I've been chipping away at these guys since i completed the test mini, and today saw them finished! Aside from the guy in the middle who looks like he has a deformed face, I'm really pleased with them. 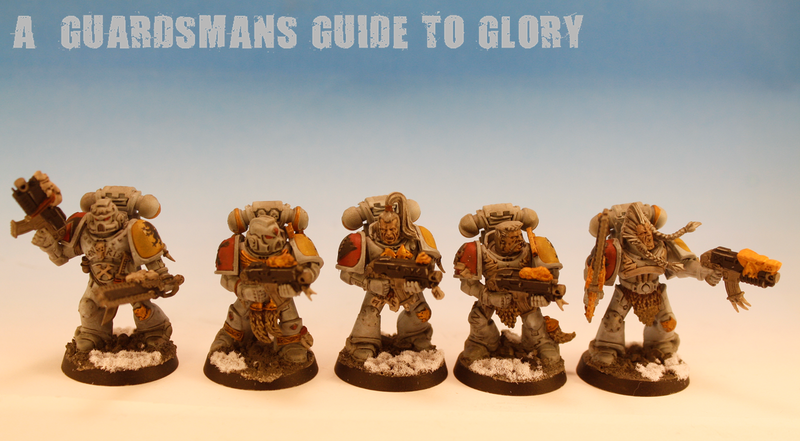 The colour scheme has been replicated easily and was pretty quick to do. Again, i really like the classic wolves look with the pale grey, and I'm looking forward to seeing how it looks on a vehicle - a Drop Pod is on the table at the moment, volunteering for that experiment! I'm just trying to find a Melta gun at the mo' so i can finish building the other 5 men of this Grey Hunters squad, and then I'll start on their paint job!